The earth’s water is one, finite supply that moves from streams to lakes to oceans, flowing underground, freezing on mountaintops and forming the clouds we see in the sky. 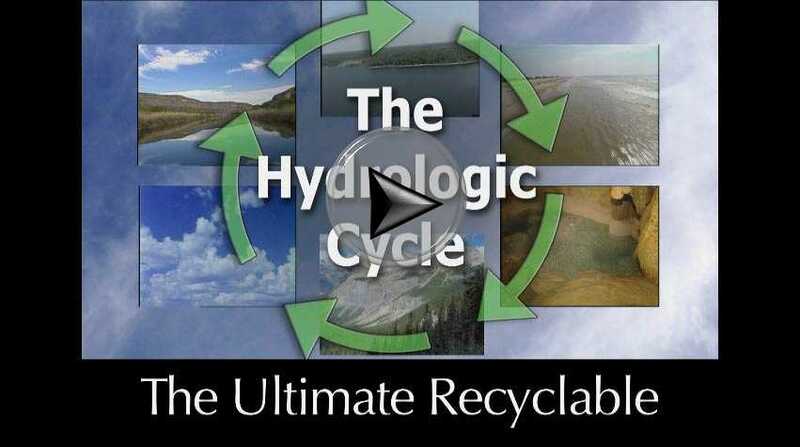 All this moving and shifting around of water is one of the largest recycling efforts by mother nature, called the hydrologic cycle and is the driving force behind our weather. 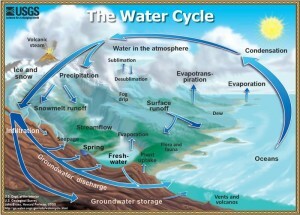 What is the hydrologic cycle? Where does it start and where does it end? Where does water spend most of its time? What is weather? What is climate? How do they affect the quality and quantity of our water? 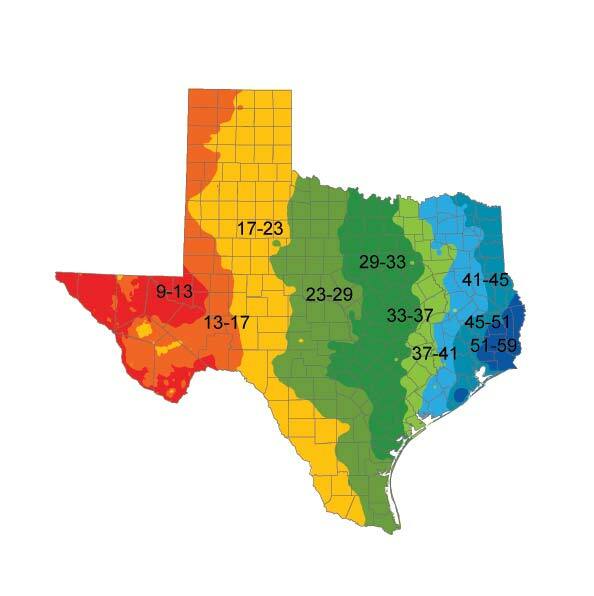 What kinds of climates are found in Texas? What is surface water? 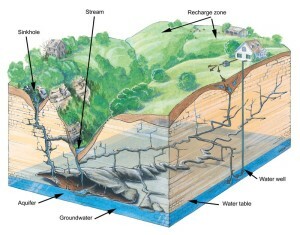 What is groundwater? Where does water go when it runs off a street? Where does our water come from? How does it get to our faucets? 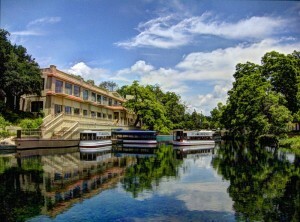 If water is so recyclable how can we use this property of water to create a sustainable water future in Texas? 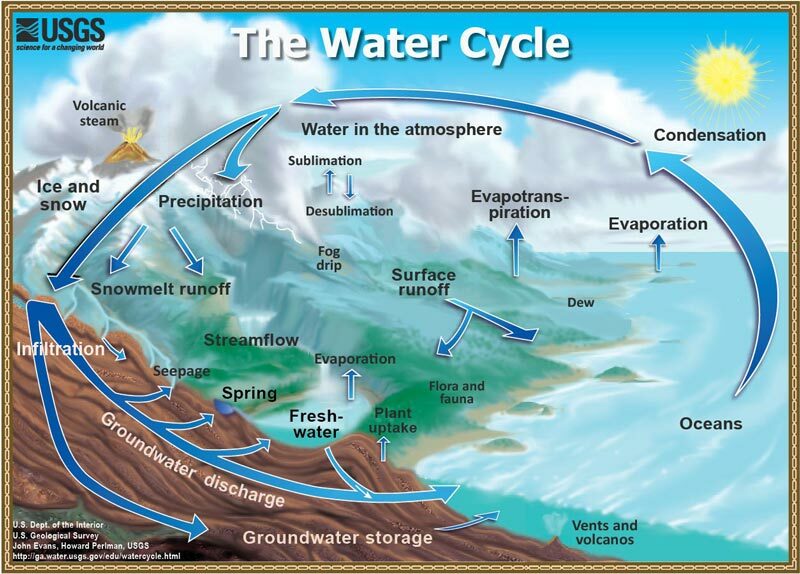 The hydrologic cycle works like a huge water pump powered by solar energy and gravity. It is a global system, and every molecule of water on Earth travels through it. Because it is a cycle, it has no beginning or end. The sun warms water on the Earth’s surface and changes it into invisible water vapor. This process is called evaporation. Every time water evaporates, it leaves behind whatever salts, pollutants or other impurities were dissolved in it and becomes pure again. But as soon as the purified water is exposed to air or Earth it begins to pick-up pollutants again. This is why even rain can be polluted with contaminants found in Earth’s atmosphere. 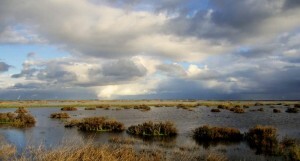 Living things, which make up the biosphere, also return water to the atmosphere. Every time we exhale, we release water vapor. Photosynthesis causes plants to release water vapor into the air in the process of transpiration. A one-acre cornfield (about the size of a football field) can give off as much as 4,000 gallons of water every day through the corn plants’ leaves, or as much water as you will use to take about 600 showers. Rising air takes the water vapor up into the atmosphere where it cools. Cooling water vapor condenses into tiny suspended water droplets as fog, mist, or ice crystals which we often see as clouds. In fact a cloud is really just a huge group of tiny water drops held up by rising air. (Fig. 2.2) Raindrops and snowflakes condense around microscopic dust particles also suspended in the atmosphere. Water can pick up other contaminants from the air, too, such as smog (forming acid rain) or mercury vapor from trash incinerators and coal-burning power plants. Water returns to Earth as precipitation, either liquid (rain) or solid (snow, sleet or hail). This happens when the rising air can no longer hold up all the droplets of water. Water vapor can also condense on ground-level surfaces as dew or frost. About 85% of the world’s precipitation falls into the oceans. The rest falls on land. Texas is so large it is affected by air drawn in from the Pacific Ocean as well as the humid topical air flowing in from the Gulf of Mexico. The state’s vast size also means climate varies greatly from north to south, and east to west. (Fig. 2.3) Rainfall increases going from west to east. The wet season does not happen at the same time everywhere. North, Central and East Texas receive the most rain in late spring, while the Panhandle and West Texas receive the most rain during the hottest months of the year. 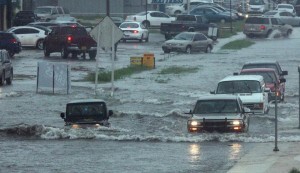 Coastal areas of Texas receive the most rain in late summer and early fall. Most of Texas has a modified marine climate, which means it is influenced by the onshore flow of tropical air from the Gulf of Mexico. From October to June this tropical air which is full of moisture collides with colder dry air from the north, resulting in thunderstorms over Central Texas. Along the coast hurricanes can bring huge rain storms with large amounts of rain falling over short periods. This may cause flooding, water surges in bays and estuaries and high winds. Peak time for hurricanes is late summer and early fall. 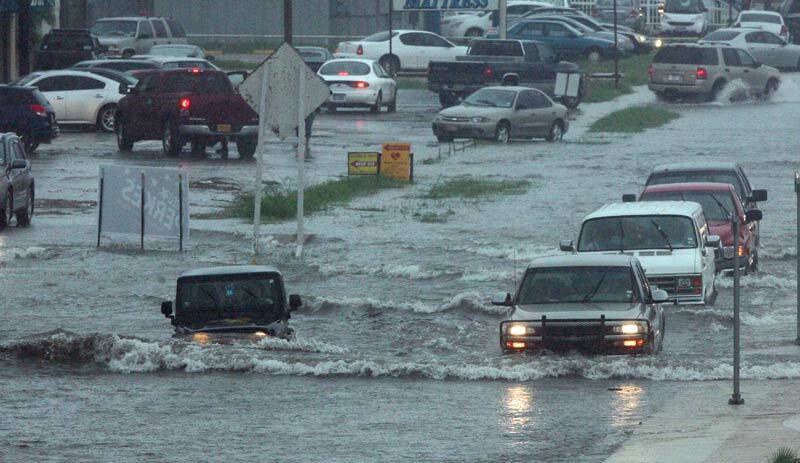 Texas is known for its extreme flooding. 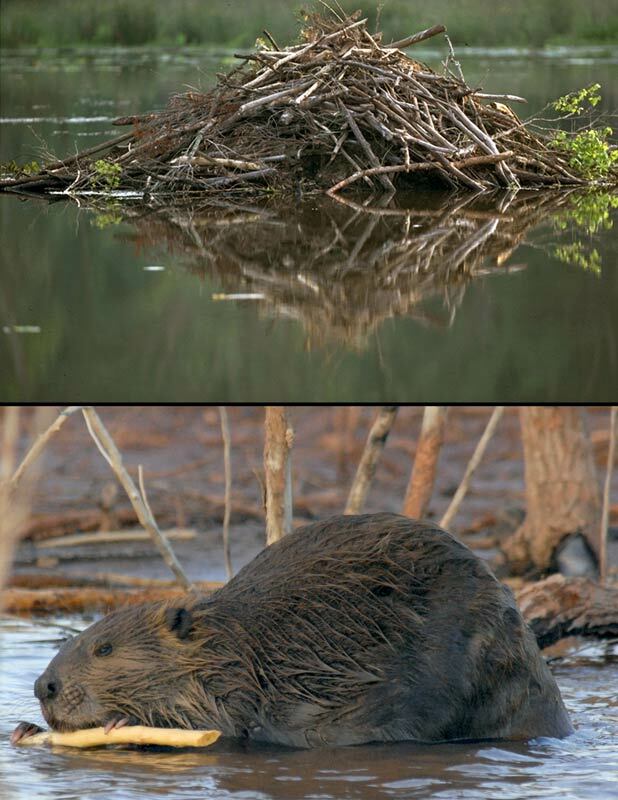 Flooding is natural, but can cause major damage to buildings, homes, roads, as well as damage to aquatic resources and habitat for wildlife. While droughts do not happen as fast as floods, they may also cause severe economic damage and harm aquatic resources and wildlife habitat. (Fig. 2.4) Damage to property and habitat can be reduced by preserving wetlands and allowing natural sediment transport and adequate freshwater inflows into our estuaries and bays. Temperatures also vary throughout the state with coldest temperatures in the north and warmest in the southwest (an area known as the Trans-Pecos). Water also plays a role in temperature. In dry areas the difference between the highest and lowest temperatures is larger than in more humid areas. Water in the atmosphere, called humidity, buffers large changes in daily temperature. This is why even if Houston and El Paso have the same daytime temperature, Houston will typically be warmer than El Paso at night because the higher humidity in Houston will keep the air warm. Weather forecasters sometimes refer to the effects of El Niño and La Niña. These are changes in ocean-atmosphere conditions that can happen every few years and affect weather around the globe. El Niño occurs when the area of warmer waters in the tropical Pacific Ocean expands, causing warmer, wetter, and more severe weather conditions in Texas. 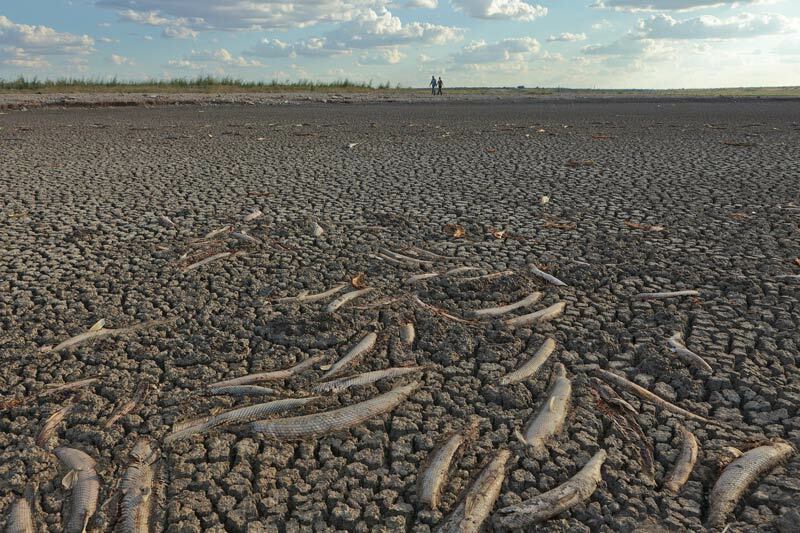 La Niño occurs when the area of warmer waters shrinks in the Pacific Ocean, causing cooler, drier conditions in Texas. The National Oceanic and Atmospheric Administration (NOAA) notes that El Niño is occurring more frequently. Is there a connection between this frequency and global warming? Will we have more severe weather because of this? According to NOAA, these are the important research questions facing scientists today. 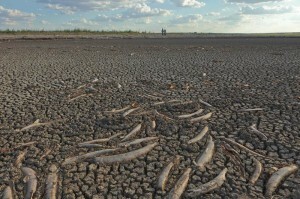 Many scientists believe we are now encountering a period of rapid climate change. 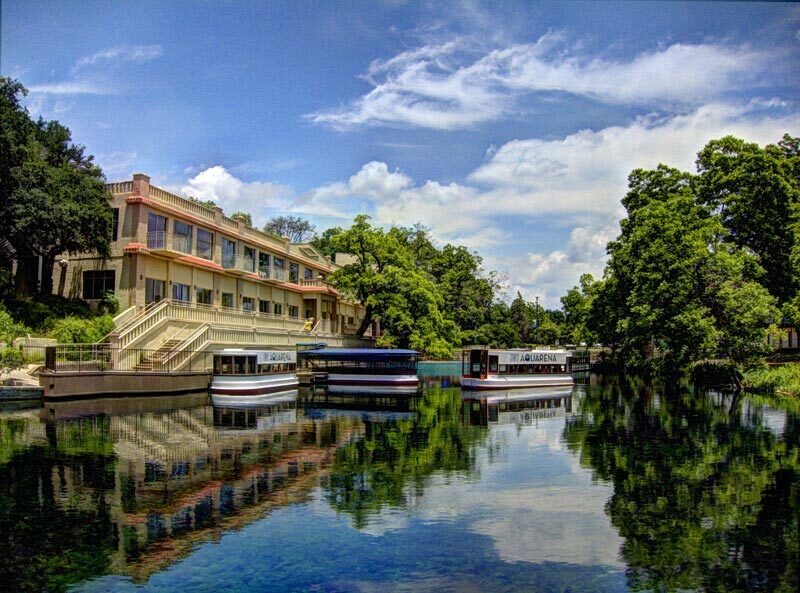 Overall, Texas is known for extremes in weather, from droughts to floods, to freezing temperatures and burning heat. All are present and relatively common in our state. When precipitation falls as snow, it can build up as snowpack, ice caps, and glaciers. Ice caps and glaciers can store frozen water for thousands of years. Snow in warmer places melts when spring arrives. The melted water that does not soak into the ground flows overland and is called snowmelt. If rain is hitting the ground faster than it can soak in, it becomes runoff. The slope of the ground also affects runoff. On steep slopes, water moves quickly and very little of it soaks in the ground. Hard surfaces reduce the amount of water that soaks into the soil even further. In urban areas, there is less porous ground for the rain to soak into. Paved roads, rooftops, and parking lots block water from soaking in, so all of it becomes runoff. Heavy rains run off streets, sidewalks, and other paved surfaces up to 10 times faster than on unpaved land. Some people use rainwater harvest barrels or tanks to collect water as it falls from building roofs. The water can then be used to water plants during dry periods/when rain is scarce. This is a good way to conserve water. The faster water flows, the more power it has to wash away soil or to cause flooding. (Fig. 2.6) Storm water that runs off paved roads, rooftops and parking lots flows into ditches and storm drains. This water then drains directly into streams, lakes and wetlands without any filtration or treatment. Any excess fertilizer, pesticides, mud, motor oil and antifreeze, trash, even lawn clippings and pet waste on the pavement or roads wash into waterways during heavy rains. This type of “runoff” is called non-point source pollution and is the leading cause of pollution of our aquatic resources in the United States. Only about 3% of the rain soaks into the ground. When water soaks into the ground it fills the empty spaces between soil particles. The water may remain as soil moisture, evaporate back into the atmosphere, be taken up into the roots of plants or trickle slowly through the soil. The solid part of the Earth is called the geosphere. Below the Earth’s surface, layers of spongy soil, sand, and rock act as filters to help clean the water. If the water is badly polluted or contains certain contaminants, the soil can’t remove all of the pollutants. In some cases, water moving through the geosphere can even pick up pollutants already present in the soil. Eventually the water reaches a layer where all the spaces in the soil or rock are already filled up. This area is called the saturated zone, and the water it holds—over half of the freshwater on Earth—is called groundwater. (Fig. 2.7) The boundary between the spongy layer and the saturated zone is known as the water table. 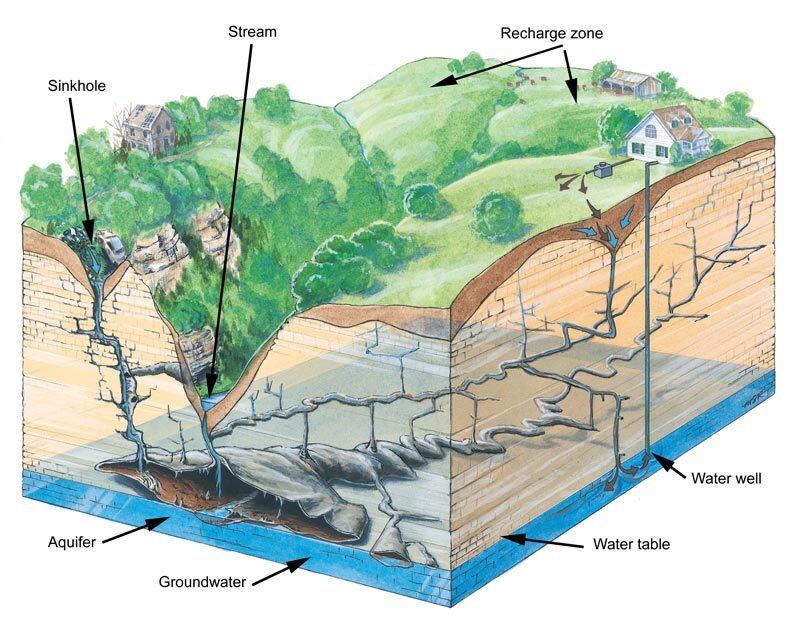 The water table rises or falls as the amount of groundwater in the saturated zone increases or decreases. 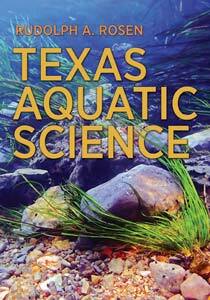 Texans depend on both surface water and groundwater sources for drinking and other uses. In general, people in the western portion of the state use groundwater while in wetter parts of the state large reservoirs hold surface water that can be added to groundwater sources for use by people. Some well water is safe to drink right out of the ground. In other cases, it must be treated first. For community water supplies, water from wells or lakes is piped to drinking water treatment plants. At the plants, workers may filter the water or let it settle to remove suspended material. They also may add chemicals to the water to kill bacteria and other organisms. Pipes buried in the ground carry the water to homes and businesses. A different set of underground pipes carry used water (sewage) to wastewater treatment facilities. Sewage from homes and business that are not located in towns or cities usually goes to underground septic systems that store wastewater until it can soak into the ground. The solid material is disinfected and often recycled into fertilizer. Wastewater treatment systems use bacteria to break down much of the organic waste in the water, and make the wastewater safer to return to the environment. Water from sewage treatment facilities is piped back into surface waters such as rivers, lakes and wetlands after it is treated. Wastewater treatment is important to the reduction of water-borne diseases that can sicken humans and even cause death.